Most of us treasure these last days of summer, as the days get shorter and the breezes warmer and the backyard tomatoes are ripe for picking. There’s nothing like sitting on the porch or in the yard or even in one’s own kitchen, enjoying the evening breezes, Sinatra singing, and a fresh tomato tart. That is, unless you live around the Republic Bank parking lot, which this week will be the site of both a Wednesday movie night and a Saturday evening India Day program that includes a concert. The Minutes of the SSA meeting reveal that initial plans for tonight called for a restaurant crawl, movie night, and ribbon cutting starring the Mayor. He may show up. He’s running for reelection and what better way to show the Indian community he loves them? It will boost Silverstein’s reelection campaign as well–another photo for the weekly family album, er, constituent newsletter. The India Day event, including the parade and the party-in-a-parking lot , is expected to cost $100,000, most of it privately funded. The original proposal included a talent show, a fashion show, and a concert. I wonder how much of that is being spent for the privilege of eating cake alongside an alley. You’d think the organizers would want to do better by their guests. The SSA is also planning a back to school event for next August in the same parking lot. How this will drive business to Devon is a mystery. No stores on the street sell school supplies or children’s shoes or clothing. The Indian businesses long ago made it clear they don’t want local residents in their stores, and I doubt if many tourists shop here for pencils and paper. Every year the Chicago Community Trust invites City residents to participate in discussions of topics of public interest and public policy. The program, known as “Open Table,” organizes these citywide discuussions neighborhood by neighborhood. This year, the West Ridge Community Organization and the West Ridge Chamber of Commerce are co – sponsoring the OpenTable program that will take place on Thursday, May 10th, at the Northtown Library, 6435 North California, from 6 to 8 p.m. The selected topic is economic planning and development in West Ridge. Discussions will begin with a presentation by Abraham Lentner, city planning instructor att the University of Illinois at Chicago. After his presentation, the audience will break into small discussion groups to share ideas about potential eonomic dvelopment improvements for our neighborhood. The audience will then reconvene to share each group’s ideas, concerns, and recommendations. The event is free. If you have any questions please contact the West Ridge Community Organization or the West Ridge Chamber of Commerce. SSA #43, the Special Services Area taxing district that adds an extra 1.5% property tax levy to real estate on Devon from Kedzie to Damen and on Western from Granville to Arthur, received City Council approval for its 2017 levy on November 15, 2016. By law, there was to be a public meeting about the increase before the budget was approved, but I was unable to uncover any evidence of either the notice or the meeting so I e-mailed the West Ridge Chamber of Commerce for the meeting date and the name of the paper(s) where the notice was published. I have yet to receive a response, the Chamber no doubt busy planning its next business-building children’s event. However, on Monday, November 28, Chamber personnel posted the “Minutes” of a purported “Community Meeting Regarding the Budget Levy Increase” allegedly held on October 27. According to these “Minutes,” “Meeting was called to order at 6:10 p.m. No community members attended and no questions were presented. Meeting was adjourned at 6:12 p.m.” The alderman is listed as present. Interestingly, the Minutes of the SSA’s October 27 regular meeting were also posted on November 28. That meeting was also “called to order at 6:10 p.m.” but not adjourned until 6:56 p.m. So it appear that the two meetings were held simultaneously. I’m sure this will be corrected. The devil is always in the details. Still no word on where the legally-required notices for the legally-required meeting were published. This sure seems like yet another example of the contempt the powers-that-be have for neighborhood residents and the concept of transparency in government. The meeting was also attended by Mike Parella, who was otherwise unidentified and whose presence was unexplained.There is a Project Coordinator with the City’s Department of Planning & Development by the same name. Maybe he was there to witness the neighborhood’s indifference to the alderman’s way of doing business. Maybe the lack of community presence was taken as confidence in her vision. Or maybe the dismal state of the neighborhood’s main shopping district has been noticed by City honchos who are finally helping the alderman with her six-years-in-the-making-and-yet-to-be-released “spirited economic development plan.” Let’s hope so. Residents have been unable to connect with her on the issue. The SSA’s budget is stated in the ordinance (SO2016-7364), which can be found by searching the City Clerk’s Web site. It’s a lengthy document, and contains two separate applications and budgets, one for the Chamber and the other for the new “sole service provider,” the Rogers Park Business Alliance. The ordinance was amended to make the Business Alliance rather than the Chamber the service provider. Note how the monies are budgeted. Most of it (more than $270,000) goes to “Public Way Aesthetics,” the primary job apparently being cleaning-up after the litterers, spitters, and food-tossers who shop on Devon and don’t care about dirtying the neighborhood. Rice Computer Services is to be paid $4,000 for repair and maintenance of the Big Belly trashcans. “Customer attraction” is budgeted at $54,000; less than half that sum ($25,000) is earmarked for “Safety Programs,” and only $12,000 will be invested in business development. Mixed-up priorities? “Sustainability and Public Places” gets $8,000. Perhaps that will result in an investment in signage, such as “No Spitting” or “No Parking in Bus Lanes” or “Parking in Crosswalks Prohibited.” Perhaps the presence of uniformed police or Revenue Department personnel writing tickets would also be effective deterrents. No 50th Ward businesses landed service contracts. Instead, two of the six subcontractors listed by the Business Alliance are from outside Chicago, and one is in Maryland. Three are from other neighborhoods. Why hire a $16,000 accountant from Skokie when there are many accountants in the Ward? No local businesses can make street banners (to be provided by a company in Blue Island at a cost of $10,000) or provide landscaping and holiday decorations ($25,000 to a business in Rockville, Maryland)? Of course, there has to be a consultant, paid $30,000; at least the business is in the City, as is the $20,000 snow shoveler and the $4,000 auditor; the latter is located in Edgewater. Stealth taxes. Secret, two-minute meetings. Services from vendors outside the Ward. FunFest was a wild success for children but a total bust as a business booster for Devon businesses. It showcases once again the absence of leadership in the West Ridge Chamber of Commerce as well as its desperation. It plans events like this in an effort to make itself a presence in the community while failing completely in its mission of business development. The Chamber’s inability to secure participation from any storekeepers on Devon turned the heavily-publicized event into a children’s party. The fest was attended by a couple hundred children, who had a great time with games, face painting, and other activities. The music was way too loud, as usual, and played at a level guaranteed to damage the hearing of kids who stayed too long or got too close. But the fest was held in the poor part of the ward, and the Chamber–to the extent it considered the effect of the decibel level on children at all, which is doubtful–knows that poor people, in this case almost all immigrants from countries with worse educational systems than our own, don’t know about these things. Then, too, the elevated speakers were directed at housing, not at participants, and nobody’s thinking about the kids’ hearing at this kind of event. What’s a little hearing loss if it means a new account for the bank? Priorities, please. As far as boosting business, the Chamber failed utterly. No stores participated in the sidewalk sales event. Not one. I traveled both sides of Devon for over an hour and found empty sidewalks. This was to be expected, since the Chamber’s repeated attempts to get merchants to participate in the Devon Community Market also went nowhere. Merchants tell me that there’s nothing the Chamber can do for them. They’re right. It’s completely irrelevant, its activities, such as they are, nothing more than blundering attempts to get noticed. The Chamber supposedly exists as business development experts, not as party planners. You’d never know it. Successful chambers of commerce, such as those in neighboring wards, work with development-minded aldermen to support the community through business recruitment and development. By encouraging economic progress that creates jobs for residents and strengthens residents’ ties to local commerce, chambers of commerce help build the loyalty that turns neighbors into repeat customers who keep businesses profitable. So there’s already one problem: our alderman has zero interest in business development, thus our rudderless Chamber lacks vision or direction. Strike one. Call the Chamber and ask how many businesses there are in the ward. I’ll save you the trouble: They don’t know. Oh, they can tell you how many business licenses there are—that’s an easy look-up–but that’s not the same thing. Ask them what kinds of businesses have set up shop here. They don’t know that, either. How many of a given type of store are here? Duh. Is there a West Ridge business directory? Yes—but only of the approximately 200 businesses that belong to the Chamber. Two hundred—in a ward with over 1,500 businesses. Does the Chamber have an active business recruitment program? How does the Chamber sell the neighborhood to prospective businesses? What is the Chamber doing to alleviate the parking problem? Would the Chamber’s time be better directed to attracting and retaining commerce than hiring face-painters? Strike two. As regular readers know, the parking lot at Republic Bank lacks both PPA and PVA licenses. Both live and canned music were blasted at yesterday’s event in violation of City law. I asked Barbara Singal, the Chamber’s Executive Director, if she had a permit for the music She showed me two sheets of paper, one clearly labeled “Application for Permit” and the other purportedly a letter from the alderman in support of the event. Singal claimed “the commissioner” had signed the permit. When I attempted t get out my glasses to read the documents myself, she took them out of my hands and replaced them in her tote bag. I suspect they’re bogus but asked her to email the documents to me; we’ll see if she does. In the meantime, tell me how you’d feel if this were blasted in your direction for several hours on an otherwise lovely late summer afternoon. Where Singal and Robert Taylor, the bank’s manager and this year’s Chamber president, live, this kind of children’s event is held in the local park so it won’t disturb residents enjoying their yards on one of the last summer Sundays. Aren’t my neighbors and I entitled to the same consideration? Do you think Silverstein would write a letter in support of such an event where she lives? When children behave this way, we call it bullying and tell them why it’s wrong. When aldermen and those who derive their power from aldermen do it, it’s still bullying and it’s still wrong. They must be held accountable for it. Strike three. Silverstein is a city official sworn to uphold the law. If a permit was obtained, strings were pulled to get it. It’s also possible that Singal and Taylor were bluffing; this may be why the papers were snatched away before I could read them. The blasting yesterday—the 27th musical performance in the lot—is just the latest in a pattern of abusive behavior for which the bank, the Chamber, Singal, Taylor, and the alderman must be held accountable. Fore more information on loud music and hearing damage in children, click here. Raise your hand if you’ve heard of SSA #43. Maybe you’ve read about an upcoming SSA meeting in the alderman’s weekly newsletter? Maybe you’ve read about major decisions taken by its Board that determine not only Devon’s cleanliness, snow removal policies, noise level, and decorations, but also how much property owners within the SSA district will have to pony up in extra real estate taxes to pay for these services? No? You should know about it, because SSA #43 taxes property owners within its boundaries (Kedzie to Damen on Devon, Arthur to Granville on Western) to support its initiatives. It’s one of those anonymous, quasi-governmental bodies with taxing authority that has its hands in residents’ pockets and hides in plain sight. SSA #43 is the Special Services Area for Devon Avenue, created by the West Ridge Chamber of Commerce and the Devon merchants to boost business on Devon Avenue without having to actually address the basic problem, i.e., exclusionary retailing, or make any substantive changes that would require economic planning involving the entire West Ridge community. It’s worth noting that one of the objectives mentioned in the financial statements (Note 1) is to establish competitive commercial districts; how this can be accomplished when merchants refuse to serve most of the immediate market is not addressed. The SSA is run by the Chamber of Commerce and the SSA Board to benefit businesses within its district, although some receive no help at all while others control the Board and the money and use it primarily to benefit merchants between Western and Washtenaw. You know—the merchants who don’t want local residents in their stores unless those residents are the right ethnicity. This used to be called discrimination, but it’s not politically correct to say that in relation to minorities. Let’s call it exclusionary retailing: by stocking merchandise that supports the culture of only one ethnic group in our diverse community, shoppers from other ethnic groups are not only excluded but also actively helped to self-select out of local stores. Because 80% of the neighborhood is not the target market, merchants must rely on shoppers from other areas and tourists to make money. And those shoppers now have better places to go. In theory, the SSA’s Board represents both business and property owners. In fact, it doesn’t. In addition to its tasks of removing snow (except on Tuesdays, when there’s no point since the stores aren’t open and who cares about pedestrians anyway?) and cleaning up the mountains of garbage left by shoppers, the SSA also helps plan and fund so-called “community” events, such as the upcoming FunFest and the Devon Community Market. These events always fail because (1) the larger community doesn’t shop on Devon and therefore doesn’t care about business-building efforts; (2) there’s no parking; and (3) the planning group lacks imagination except when it comes to reporting fantasy figures for attendance. This year the SSA planned to spend tax dollars on street banners celebrating Indian and Pakistani Independence Days. No money was spent on banners to celebrate American Independence Day, which joins Presidents Day, Memorial Day, Easter, Purim, Labor Day, Halloween, Hanukkah, and Christmas as holidays no longer recognized or celebrated by store owners on Devon. The SSA does celebrate Hindu holidays and created an all-night Eid shopping event–wihout warning nearby residents, many kept awake by the cars, music, fireworks, screaming children, and boisterous adults celebrating the end of Ramadan. It took a 3:00 a.m. thunderstorm to get them to go home. There was an attempt to renew the SSA for another 15 years–until 2028–but it failed to pass the City Council in May 2015. [Note that the link to the Council ordinance specifies that certain “private information has been redacted from public viewing.”] The tax increase requested by the SSA (from .40 to 1.5%) was in addition to all other property taxes levied, so I suspect the failure to pass was related to the whopping property tax increase about to be levied, but the SSA did not let the issue die. On further checking, I found that the Council approved the money grab in December 2015 with the signing of agreements which are, not surprisingly, no longer available on the City’s Web site. Both the 2015 and 2016 agreements have vanished, although the Web site assures me that City staffers have been notified and will search for the missing documents. Imagine: public documents relating to a secretive property tax hike suddenly gone from public view. And I mean suddenly— they disappeared the day after I accessed them. The SSA currently has three vacancies, according to the April 2016 minutes. While I strongly encourage community members to apply for appointment, be warned that the alderman makes the choices, though members are technically mayoral appointees. It’s a given that she–and they–won’t want anybody who speaks for residents or thinks independently. The next meeting of SSA #43 is on Thursday, September 15, at 4:00 p.m. at the alderman’s office Meetings are open to the public, but don’t be surprised if you show up and the meeting is cut short, or everything under discussion is moved to executive session. SSA #43 is yet another instance of the powers-that-be operating in secrecy. The 2013 initiative claimed public outreach, but did anyone from the community attend? Hard to tell, especially if the 2013 creation and 2015 attempt at renewal are any gudes. In 2013, only 100 copies were published of a “Special Pamphlet” describing the district and outlining its funding and its responsibilities. That isn’t enough copies to distribute to the businesses in the SSA district, let alone the residential property owners. In 2015, notice of the SSA’s request for renewal was published not in a local paper, where residents might actually see it, but in the Chicago Sun Times classifieds, where it would be easy to miss. Of course, if you don’t know there’s an SSA that’s taxing you, you wouldn’t be looking for any such announcement, would you? It wasn’t mentioned in the alderman’s newsletter, either. In both cases, the SSA met the letter of the law—notice was given, but not its spirit—actually informing the public. The SSA was helped in its quest for a tax hike by an expensive consulting firm, Place Consulting. Its Community Engagement page provides a blueprint for the kind of outreach this SSA needs to do if it really wants to fully engage residents in economic development. But I doubt if that’s the SSA’s goal. Levying taxes in secrecy and ignoring the community’s needs and desires suits them better. Didn’t America’s founders fight a war against this? I hear that FunFest, sponsored by the West Ridge Chamber of Commerce, the Silversteins, SSA #43, and a few businesses and community organizations, needs volunteers who can help support the event, scheduled for the Republic Bank parking lot on August 28. This is the same crowd that made such a mess of the Devon Community Market. They never learn from their mistakes. The neighborhood has never shown any support for non-events like this, so organizers have combined it with a sidewalk sale. If you need suitcases, phone cards, hookahs, cheap trinkets, or fruits and vegetables, this sale’s for you. If you’re looking for the “international shopping” the promoters are claiming, go somewhere else. Buying cucumbers and lottery tickets from vendors from different cultures does not quality as international shopping, but getting the powers-that-be to understand this is impossible. There’s no better example of the poor thinking and lack of imagination of this event’s organizers than in the decision to once again use the Republic Bank parking lot as an illegal entertainment venue. Let’s set aside for a moment the blatant disregard for nearby residents or the arrogance on display in ignoring both the law and common decency. After all, the Silversteins’ co-sponsorship makes the law what they say it is; the fact that they and their neighbors wouldn’t tolerate this disrespect for a second just adds insult to injury. Instead, let’s look at this from a practical standpoint: using this lot for entertainment prevents it from being used for parking. This is so typical of the way this group thinks–plan an event to attract hundreds of shoppers, then close the second-largest parking facility in the area so it can be used for face-painting. The sheer stupidity of it is mind-boggling. If you’d like to volunteer, please contact the Chamber. It needs all the help it can get. Yesterday the Republic Bank on Devon held its first recycling event. Bank Manager Robert Taylor described it as “something nice for the neighborhood,” but that depends on where you live and how you spend your Sunday mornings. In my opinion, waking up to recycling trucks is not the best way to start the day, especially when the trucks are located directly alongside residential housing. It’s yet another example of the Bank’s utter disregard for its closest neighbors. The fact that Taylor is this year’s president of the Chamber of Commerce only makes it worse. Devon Bank holds these recycling events several times a year in its parking lot on Western. It, too, has residential housing directly across the alley, but Devon Bank’s executives take care to locate the noisy trucks closer to Western than to housing, leaving plenty of room for vehicles to move in and out. Devon Bank’s courtesy toward its neighbors is not shared by Republic Bank. When I asked Taylor why the trucks were located at the north end of the Republic lot—closest to housing—he replied, “I didn’t think it would be a problem.” Really? ?When I asked if he’d stand for having these trucks alongside his home, he raised his arm and pointed to his watch. “It’s 9 ‘clock,” he said, and then added “Is there anything we can do to please you?” This was a reference to my past complaints about the number of noisy events held in what neighbors were assured was “just a parking lot” when it was built in 2012. The Bank miscalculated when it built the lot, tearing down that part of its building that housed rent-paying tenants, like medical, accounting, and real estate offices while hoping to cash in on the street scape. Grateful shoppers show their resentment at paying for parking by cheating the Bank in every possible way, including breaking the gates so they don’t have to pay. Transforming the space into an unlicensed play lot won’t save it. It’s been home to the Devon Community Market, with its live and canned music blasting from huge speakers, and several live concerts sponsored by the Federation of Indian Associations (FIA). There is only one properly-licensed venue on Devon for this kind of event, but the Chamber and the other groups won’t use it. Instead, all of these events have been staged without proper permits or licensing directly across the alley from residences. I realize that the Bank would like to increase its presence in the community as a way to increase its business. Nothing wrong with that, but using its parking lot as an entertainment center while ignoring the laws that govern such things is simply wrong. It could choose to perform other services for the community, like sponsoring kid’s sports teams. It’s not going to increase business by annoying people. The parking lot is not zoned for performances of any kind. This presupposes, of course, that one of the alderman’s patented stealth zoning changes has not already occurred. I am still searching the City’s zoning records to be certain, and so far have not found any changes. I can say with certainty that no warning of an impending zoning change has ever been issued to nearby residents, but this reflects only the standard lack of transparency about these things in this Ward and does not relate to whether any such changes are planned or pending. Most of my neighbors have given up trying to be heard in the councils of power that decide how we all live with this lot. Others have made accommodations—they put up with the noise without complaint in exchange for some benefit that only the powers-that-be can grant. Some even believe that it’s better not to complain to avoid the retribution that so often accompanies standing up for one’s rights. Unfortunately, when enough people choose silence in the face of abuse by the powerful, the abuse gets worse. No person or group that sponsored any musical or “special” event in the Republic Bank parking lot in the past three years has applied for the City’s Special Events Permit. That’s because City law requires sponsoring groups to submit a written plan in advance advising the City on the sponsor’s plans for bus reroutes, garbage disposal, general clean-up, street closures, food service, and other aspects of the event. Other applications and licenses may also be needed, depending on the event’s specific activities. These groups simply act as if they have all the authority they need. Many assert that the alderman is fully aware of their event and approves of it. Why would anybody think the alderman can approve breaking the law? Or that her knowledge of an illegal event implies consent? I attended a January workshop held by the City’s Licensing Department to learn what licensing is required to sponsor a public entertainment event. I learned that, BEFORE applying for the DCASE application, one must first ensure that the chosen venue is appropriately licensed by the City. Furthermore, aldermen may not interfere with the licensing process, in other words, they may not intervene in favor of an applicant nor waive the licensing requirements. This is the biggest hurdle for sponsors and organizers: musical events can be staged only at venues that hold a Public Place of Amusement (PPA) license. The Bank parking lot doesn’t have one and cannot get one because such a venue requires a distance of at least 125 feet from residential housing. The only place on Devon with a PPA license is Bombay Hall, below street level at the site of the old Hillman’s. Not surprisingly, organizers want their events at street level, in hopes of attracting crowds. If this means trampling on residents’ rights, they don’t care. These events tend to be staged at night and on weekends, when City offices regulating noise control and licensing are closed. Complainers are referred to the alderman, who isn’t available nights or weekends, although you can leave a message and she’ll get back to you when the event is over. This presents a problem for law enforcement, which cannot shut down these illegal events because (a) complainants are accused of racism; and (b) the event organizers claim they have the alderman’s permission. Any cop who even tried to stop one of these illegal events would no doubt find himself walking a beat in Englewood within the hour. I talked with one man supervising the concert who told me that they didn’t have to apply for any permits because “…the City takes care of everything.” Howdoes it do that when it’s not aware the event is scheduled? Well, Washtenaw Avenue was suddenly closed in mid-afternoon, after the concert started, when drivers learned that the parking lot was closed to traffic. They were permitted to enter Washtenaw at Arthur, but did not learn they couldn’t exit until informed by a sign hastily posted at the east-west alley, Event organizers didn’t care. These concerts, by the way, are set up beginning at 6 a.m. on a Saturday morning. Huge tractor-trailers block our alley while barrels of supplies roll down metal ramps, men shout instructions at one another, tents are erected, the stage constructed, food tables and audience chairs are set up, speakers tested—all of this occurring ten feet from sleeping residents. Most of my neighbors are not about to tangle with a couple dozen arrogant, physically-powerful men hauling barrels and heavy equipment around a parking lot at that hour of the morning. Isn’t physical intimidation a form of bullying? Neither this year’s Indian Independence Day concert nor the extensively-publicized FunFest sponsored by the alderman and West Ridge Chamber of Commerce—both scheduled over the next three weeks—have applied for any special use permits from the City. Neither has met the statutory requirement of notifying nearby neighbors 30 days before the event that it has been scheduled. Using FOIA, I asked the City’s Department of Special Events and Cultural Affairs (DCASE) for copies of any and all applications for special use permits for events to be held in the Republic Bank Parking Lot. As of August 5, none have been located. FunFest is an especially interesting case study of what’s wrong with the Chamber of Commerce and its approach to economic development. And it’s yet another event that lacks the proper permits yet enjoys the alderman’s sponsorship. It all begins with a little-known taxing district that is the subject of tomorrow’s post. The West Ridge Chamber of Commerce is partnering with Republic Bank to sponsor an event built around the theme “Protecting Your Financial and Personal Health,” set to take place on Wednesday, April 6, from 5:00 p.m. to 7:30 p.m. at Republic Bank (2720 West Devon). Vendors include the Chicago Board of Election Commissioners, the Devon Avenue SSA (Special Services Area) #43, the Small Business Majority, an advocacy group with ties to the Democratic Party, and vendors championing immigrant rights: The Indo-American Center (various services); Apna Ghar (Our Home, fighting gender-based violence in immigrant communities); the South Asian American Policy and Research Institute (SAAPRI), as well as the Pak-American Medical Center (free health services). The selection of vendors does not necessarily suggest that business owners and entrepreneurs as well as residents from other communities within West Ridge would be unwelcome. The event’s flyer notes that information will be provided about “…many services that are offered free to the public,” and we all have an interest in utilizing the services provided by our tax dollars. The SSA, for example, covers both sides of Devon from Damen on the east to Kedzie on the west as well as Western Avenue from Arthur to Granville. Quietly renewed (meaning no public notice to residents) in 2014, the SSA impacts property taxes for residents as well as business owners, and overlaps with the current Devon-Western TIF district. Perhaps the next fair could broaden its offerings, thus attracting business owners and residents from various other ethnic groups. We can’t celebrate the diversity we talk about if we exclude 80% of the neighborhood. Building community is everybody’s business. I was disappointed to learn that only six people attended the October 21 community meeting called for the express purpose of involving neighborhood residents and businesses in planning the 2016 community market. Without community input and support, this endeavor will fail yet again, and this time the community itself will have to accept the blame. Farid Muhammad, the Market Manager, is eager to work with residents and businesses to create a market that reflects our neighborhood’s diversity. He would also like to attract the kinds of vendors–especially farmers– that residents want and will support, and to select the kinds of entertainers and artists who will appeal to residents and draw shoppers from outside the neighborhood. The 2015 market got off to a very strong start but weakened mid-season and finished poorly, although entertainment was superb throughout. The market’s history worked against it, as did the location, lack of parking, late start that led to poor vendor recruitment, and the slow sales that saw many vendors drop out after one market. Farid is committed to improving the market, and at this writing nothing for 2016 is carved in stone. He is still weighing all options. But he needs help. He can’t organize the market by himself. It’s only a small part of his job as SSA Manager for the West Ridge Chamber of Commerce. Successful markets in other neighborhoods rely on residents and businesses to staff committees, make phone calls to recruit vendors, handle publicity, etc. A core of committed volunteers from the community is the only way that West Ridge will get the market it wants. I think this is the make-or-break year for the market. I think that it needs a new name, new location, perhaps a new day and time, and maybe a shorter season. Farid has indicated that he is open to all suggestions. I’ve sent e-mails to potential new vendors and will be talking with some merchants who haven’t been part of the market. We’re a big neighborhood, with lots of artists and shops who haven’t yet been a presence at the market but perhaps should be. We should also be looking outside the neighborhood for businesses that would appeal to residents. Please feel free to contact Farid at ssa@westridgechamber.org, with any and all ideas you have, or to volunteer your time and talents for the 2016 market. Your ideas and your support are needed. Welcome to The Collaborative Palette Project. Festivities began on Thursday evening with an opening reception at Music House Academy of Music and dance. Unfortunately, I was unable to attend that program, but it held the promise of lively discussions centered around a renaissance of the arts in West Ridge. Event organizers included networking opportunities, exhibitions, and musical performances among the activities. 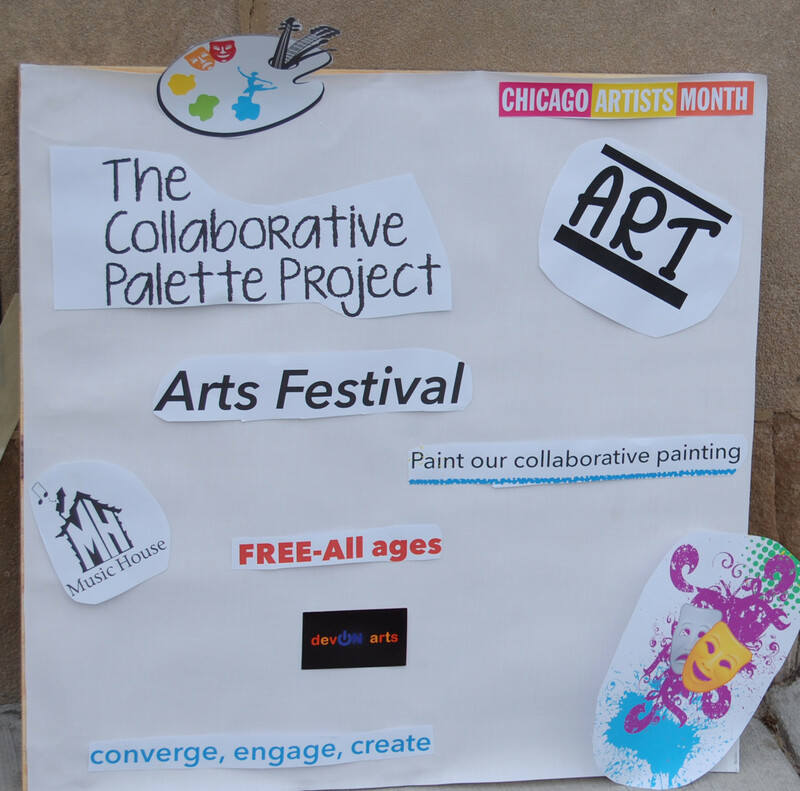 I did attend the Collaborative Palette Project Art Walk on Sunday. Most of the activity had moved back to Music House by early afternoon, and it was easy to see why. We were treated to another spectacular performance by The Ravens, a rock trio of second-graders who cover hits from bands like the Rolling Stones and also compose their own music. They actually created a gaper’s block, with both east- and west-bound vehicles stopping to listen and take cell phone videos and pictures. Performing a Rolling Stones hit. The Ravens performing for the crowd. The crowd really enjoyed the music. Outside Music House enjoying the performance. Some talented young artists helped create a collaborative work of art that’s a joy to see. The youngest artist at work. Thanks to Richard Trumbo, President of the West Ridge Chamber of Commerce and owner of Music House Academy of Music and Dance, and his staff for organizing this event. I can’t wait to see what they have planned for next year!